Rheinzink titanium zinc roof cladding was specified for the Cabarita project located on the shores of the Parramatta River in NSW. The roof in prePATINA Blue Grey Zinc was built using the double standing seam roofing system by Architectural Roofing and Wall Cladding. Designed by OIKOS Architects, this project won its builder, GNC Quality, the MBA award for Best Use of Zinc 2014. 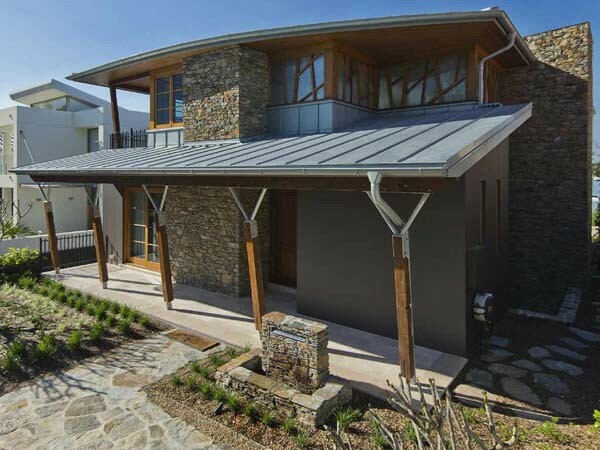 Titanium zinc roof cladding was chosen for the Cabarita residence due to its versatility, durability, ease of maintenance, and sustainability. In addition to the structural complexity of the Phillips Street project, the use of curved and low pitched roof areas and joining details demanded a soft and non-ferrous material such as Rheinzink to guarantee a watertight corrosion-resistant installation. The Rheinzink pre-weathered titanium zinc roof in blue-grey finish contrasts perfectly with the other natural building materials used in the project. With self-healing properties and no colour coating, the material is very low maintenance; additionally, Rheinzink is 100% recyclable and recognised as a low-environmental impact metal. Rheinzink is represented in Australia by Craft Metals.